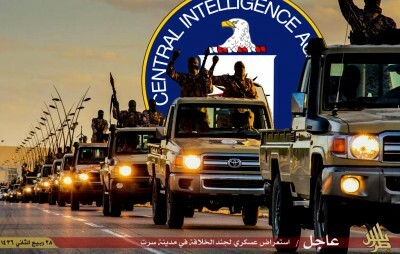 U.S. counter-terror officials have launched an investigation into how ISIS got so many of those identical Toyota pickup trucks which they use in their convoys. The [Toyota] Hilux [pics] is light, fast, manoeuvrable and all but indestructible (‘bomb-proof’ might not, in this instance, be a happy usage). The weapons experts Jane’s claimed for the Hilux a similar significance to the longbows of Agincourt or the Huey choppers of Nam. A US Army Ranger said the Toyota sure ‘kicks the hell out of a Humvee’ (referring to the clumsy and over-sized High Mobility Multipurpose Wheeled Vehicle made by AM General). The fact is the Toyotas were supplied by the US government to the Al Nusra Front as ‘non-lethal aid’ then ‘acquired’ by ISIS. Al Nusra Front is literally Al Qaeda.